This is the sixth and final article in a six part series on what to do if you are behind in your retirement stewardship. If you haven’t done so, please read Part 1, Part 2, Part 3, Part 4, and Part 5. This has been a long series, but hopefully you have found it informative and encouraging. In my last article, I focused on our example couple, Mike and Debbie. I think they may actually be in better shape at full retirement age (67) than they might have originally thought providing they take some fairly aggressive steps in terms of saving, getting their house paid for, and holding the line on expenses. Early retirement is not outside of the realm of possibility, but will be very challenging unless lots of things go their way, including things that are beyond their control. But what about you? What is your situation in terms of saving for retirement? In the next sections I am going to talk about two groups of people. Neither is particularly well-prepared, but the first has some time to catch up and the second doesn’t. The good news is that there are things that folks in either group can do to improve their prospects. The bad news is that none of it will be easy. It will take focus, commitment, discipline, and perseverance, as well as an abiding faith and trust in God. You’re behind but with time to catch up. First, let’s talk about a situation where you know you are behind but you do have some time to catch up. Perhaps you’re like Mike and Debbie. You’re in your mid fifties with ten or more years to retirement, but based on the guidelines I provided in previous articles, you are pretty sure you haven’t saved enough. Here are some things that you can do to improve your stewardship situation before you retire. The first thing you can do is start saving more right now. 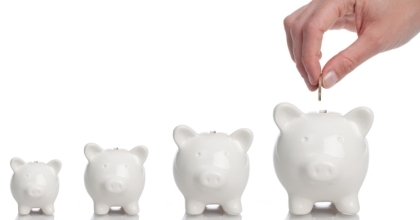 It doesn’t matter if it’s a relatively small amount; just try to increase your savings rate. One way to do that is to save any raises or bonuses your get instead of spending them. Then do that same thing each year or whenever you get a lump sum. If you are able to participate in a 401(k) retirement savings program, make sure you are saving enough to get the matching contribution. If not, increase your savings to that level as soon as possible. Once you do that, start (or increase) contributions to an IRA. And remember – both spouses can have an IRA even if only one of them has an earned income. If you’re playing catch-up, you should probably have a savings target of at least 15 to 20% of your gross income. If you can increase it even higher, to 25% or even 30%, all the better. You will likely need to make some pretty drastic changes to accomplish that. Also, if you are over 50, don’t forget about the catch up provision for retirement accounts. As of 2015 a worker age 50 or older can put $24K into a 401(k) account compared with $18K for someone younger. Catch-up IRAs contributions can increase by $1K from $5.5K to $6.5K. And remember, both spouses can have an IRA even if only one of them is working. Next, you can downsize to reduce expenses. If you can’t find the money to save, then you need to start figuring out ways to reduce your expenses so that you can have more to save. Housing and auto expenses tend to take up a disproportionately high percentage of household budgets. Perhaps you can sell your house and live someplace less costly. Or, you can trade your car for something cheaper or eliminate it altogether. That may sound somewhat draconian, but you need to be pretty aggressive about this. Do you pay for other non-necessities that you could get rid of, like health club memberships or subscriptions? Do you eat out a lot? You will need to be willing to be pretty ruthless with those things. If you are still quite a few years away from retirement, work hard to pay off your mortgage. Just ignore all the chatter about mortgaging your residence to the hilt at low interest rates so that you can invest the equity in the stock market and make a killing. One way to do that is to refinance your home with a 15-year mortgage if you have more than 20 years remaining on it. Or, just start making extra payments to principal. The goal is to be mortgage free by the time you retire. Think about it. If your mortgage (principle and interest payment) is currently 32% of your monthly net income (after taxes), and you need to be able to retire on 60% of your current income, your monthly housing cost (if you don’t downsize) will go from 32% to 53%! One of the challenges of playing “catch up” is that you don’t want to do that at the expense of giving. You want to be careful not to get so focused on saving that you no longer have anything to give. I would point you to the sowing and reaping principle that is clearly taught in Scripture. Save and give in faith, trusting that God will increase both. You’re behind, but with little or no time to catch up. Now let’s talk about the situation where you’ve basically run out of runway as you enter retirement. You may be almost retired or already in retirement and are concerned that you may not have the resources you will need. First of all, I would refer you back to number 1 in the first list above, particularly the fact that God has promised to care for you, and believe it or not, He can do that with or without your savings. So first and foremost, put your faith and trust in Him. In this situation, as with someone who needs to save more, you need to spend less – perhaps much less than you did before you retired. But you’re not spending less to save more; you’re spending less to make what you have saved go as far as possible. You will have to look at every single expense and see if you can reduce it. Also look for ways to reduce monthly debt payments, perhaps by refinancing the loans or consolidating balances into lower-cost, potentially tax deductible forms of debt. We already discussed this above, but perhaps you can work part-time in retirement. Many folks find they enjoy the social interaction and sense of purpose as well as the income, but here the focus is on the latter. Part-time work can really help your retirement income picture, but keep in mind that you may not be able to work indefinitely. Consider tapping into your home equity as an additional source of retirement income. You may scale down to a smaller home in retirement and pocket the difference to generate more income. That’s probably the best way. A Reverse Mortgage may also be an option for you, but I recommend that you consider that only as a last resort. If you are “mortgage poor” in retirement as your housing costs are now taking up too much of your income, you must consider downsizing. To increase your investment income in retirement, you could accept a lower probability that your savings will last. Be careful – that is a bit of a gamble. The recommended withdrawal rate of 3 to 4% we have been using is based on a 90 to 95% confidence level that your savings will last through your lifetime. If you decide to take additional risk and withdraw more than that each year, perhaps 5 to 6% versus the 3 to 4% that is normally recommended, the probability that you will outlive your money will increase significantly, at least statistically speaking. I wouldn’t recommend this unless you absolutely have to, and make sure you understand and are willing to accept that risk. Some people think that the best thing they can do when they have limited savings is to take steps to give themselves some protection from exposure to market volatility. This usually means putting money to fixed income investments like bonds, CDs, and bank savings accounts. This may help to dampen the volatility of their portfolio, but strictly speaking, they are not “safe.” Bonds, and to a lesser extent CDs, have interest rate risk. (When rates rise, they are essentially worth less.) They also do not protect from longevity risk (outliving your money) or inflation (loss of purchasing power). Annuities and Social Security are safer options. They potentially protect against three risks — longevity, inflation, and market exposure. Consider annuitizing a part of your savings. An annuity is simply a pooled-risk arrangement with an insurance company where you give them a certain amount of money and they agree to give you a certain amount back each month, every month, for as long as you (or your spouse, if you so choose) live. Obviously, some who are in the “pool” don’t live as long, which helps the companies make payments to those who do. If you live longer than the average life expectancy, you come out well. (There’s that longevity risk thing again.) If you don’t, the insurance company wins. I have to be honest; I’ve never been crazy about annuities, mainly due to their high fees and having to give up control of your principal. However, I am becoming increasingly convinced that they have an important place in many retirement income plans. The main advantage of an annuity is receiving a benefit you can’t outlive instead of relying only on a saving/investment account that you could outlive for any number of reasons. There is also a good possibility that the amount of annual income you receive will be more than you can generate through traditional investments without taking undue amounts of risk. Annuities aren’t totally without risk. Although they are touted as being risk free, they really aren’t. Because an annuity is essentially a contract with an insurance company, they are only as safe as the insurance company itself. You are betting that the company will stay in business and make regular payments to you as long as you (and perhaps your spouse) live. When things are “normal,” that should be a pretty safe bet, especially if you are dealing with a solid, highly rated company. But what about “abnormal” conditions? We have to consider them also. If economic conditions get really, really bad, the solvency of insurance companies could be a concern since they rely on the same investment vehicles that other financial services companies, and to some extent individuals, do. Bottom line: choose your annuity provider wisely, and for larger sums, consider using multiple providers in smaller amounts. I will discuss annuities, the different options, and how to best use them in as part of an overall retirement strategy in future articles. I am strongly considering “annuitizing” a portion of my own retirement savings, so I’ll let you know what I learn and decide. This last suggestion won’t be very popular, but here goes: Get help and support from your children. I know that’s the last thing that anyone would want to do, but it is an option. Families should take care of each other. As parents, you scrimped and sacrificed for your kids. Perhaps you spent money you should have saved for retirement sending them to college or paying for an expensive wedding or helping with the down payment on a first house. Let them know you could use some help. That doesn’t mean moving in with them, but it might. At least get closer to your family if you can – geographically and emotionally. That will be invaluable in your later years for a number of really important reasons. Finally, I want to emphasize that whatever your situation, wise planning combined with decisive action, done in prayer and with full faith and trust in God as your ultimate provider, will help you to make the course corrections you need to ready for retirement. If you have any questions about putting some of these suggestions into action, please use the contact form on this site.